Egyptian President Mohamed Morsi poured cold water today on Iran’s frenzied endeavors to keep Syrian President Bashar al-Assad afloat. With Iranian President Mahmoud Ahmadinejad seated by his side, Morsi told the opening session of the Non-Aligned Movement (NAM) summit in Tehran the “oppressive” Assad regime has “lost its legitimacy” and must go. “Our solidarity with the struggle of the Syrian people against an oppressive regime that has lost its legitimacy is an ethical duty, and a political and strategic necessity,” Morsi said. Morsi’s remarks certainly did not sit well with his Iranian hosts who remain committed to Assad, and caused the Syrian delegation to leave the conference hall. 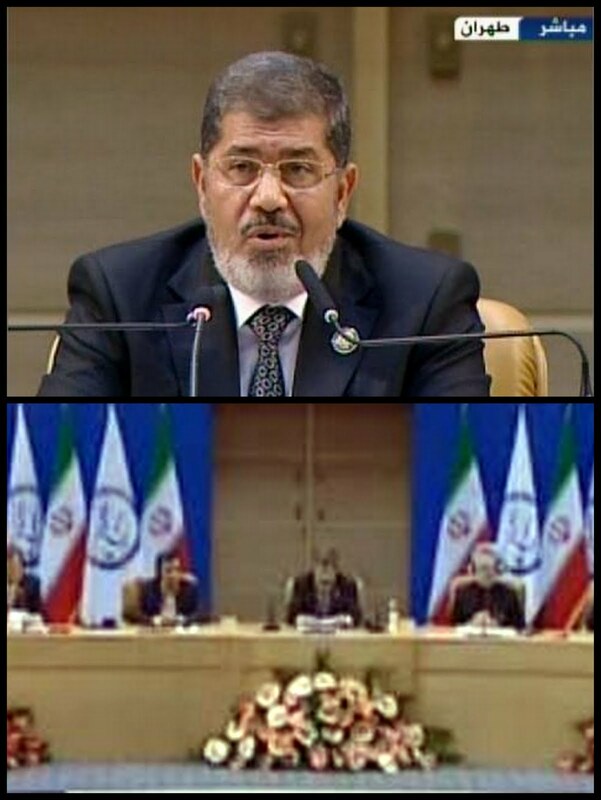 Syrian Foreign Minister Walid Muallem later accused Morsi of using his speech to incite further bloodshed in Syria. Significantly, the Syrian delegation to the NAM summit walked out as soon as Morsi addressed the Syrian issue in his speech. It was the third time in a week that the Egyptian president specifically called for showing Assad the door. Thus, Khamenei said, “prevention of arms shipment to irresponsible (opposition) groups” is the sine qua non of a solution in Syria. “Cleaning, Cleansing and the Shiite Crescent” is the title Lebanese political analyst Zuhair Qusaybati chooses for his op-ed published today by the pan-Arab daily al-Hayat. After the “cleansing” process assumed by warplanes, tanks and missiles left about 4,000 Syrians dead this month, Qusaybati writes, it took someone like Gen. Salar Abnoush, commander of the Iranian Revolutionary Guard Corps’ “Saheb el-Amr” unit to lay bare Iran’s unbridled involvement in the Syria violence. "Today we are involved in fighting every aspect of a war, a military one in Syria and a cultural one as well," Gen. Abnoush told volunteer trainees in a speech Monday. No wonder, Qusaybati writes, that Assad remains confident of stifling the opposition, even at the price of tens of thousands of fatalities. Since Khamenei chooses to lambast the West’s “arrogance” at every opportunity, how come he never mentions the “arrogance” of Russia and its lock-jawed reaction to the daily killings of children in Syria? Qusaybati asks. How can Iran offer with one hand to reconcile the Syrian opposition and the regime and deliver with the other hand hundreds of missiles to its ally in Damascus? In Tehran, Syrian National Reconciliation Minister Ali Haidar met Monday with several Iranian officials and expressed Syria's gratitude. “The people of Syria will never forget the support of Iran during these difficult times,” Mr. Haidar said, according to Iranian media. Iranian Supreme Leader Ayatollah Ali Khamenei, who has the final word in all state matters, has appointed Qasem Soleimani, the commander of the elite Quds Forces, to spearhead military cooperation with Mr. Assad and his forces, according to an IRGC member in Tehran with knowledge about deployments to Syria. The Quds Forces are the IRGC’s operatives outside Iran, responsible for training proxy militants and exporting the revolution's ideology. The U.S. blames the Quds Forces for terrorist attacks in Afghanistan and Iraq. When Iran and the Assad regime speak of a “global war” on Syria, with Russia, China and Iraq remaining seated in the stands as spectators, it is no surprise seeing MIG-23’s chasing Syrian women and children all the way to their home basements. How many more Arab children must die for Iran to fulfill its dream? Qusaybati asks.